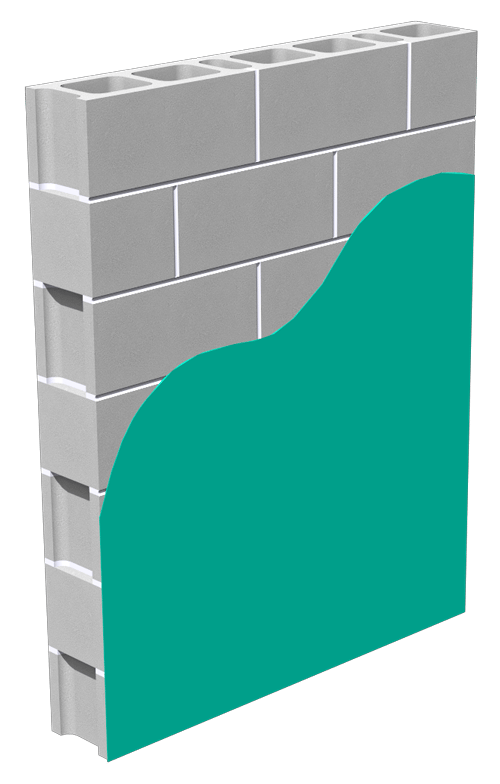 Air & Moisture Barriers - Sto Corp.
Seamless protection for the entire wall assembly. Air Barriers are required in building walls, regardless of region or climate. Controlling air leakage through the building envelope is critical to achieving high building energy efficiency. Research has shown that air barriers can play a larger role in energy efficiency than increasing insulation thickness. 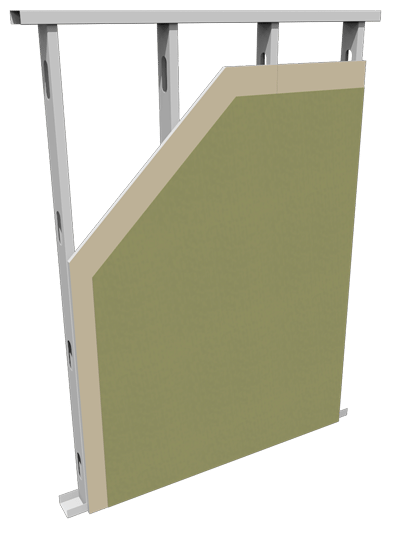 But unlike building wrap barriers that are penetrated by staples and fasteners for their attachment, the StoGuard® System provides seamless control over air and moisture to improve building performance and occupant comfort. Featuring a one-component, fabric or mesh based product solutions designed for a superior and seamless joint treatment and sheathing protection. Featuring a one-component, fabric, or mesh based product solutions designed for a superior and seamless rough opening protection. With its water-based formula meets strict SCAQMD and LEED VOC requirements. Protects fully exposed substrate for an extended period of time. The StoGuard® System includes either vapor permeable or impermeable fluid-applied membranes. Determining whether you need a permeable or impermeable air barrier primarily depends on climate and wall design. Sto Gold Coat® is a ready-mixed flexible waterproof air barrier membrane for use in StoTherm® ci Systems. It is applied directly to vertical above grade wall sheathing and concrete masonry, and functions as a waterproof air barrier when combined with StoGuard® joint and rough opening treatment. 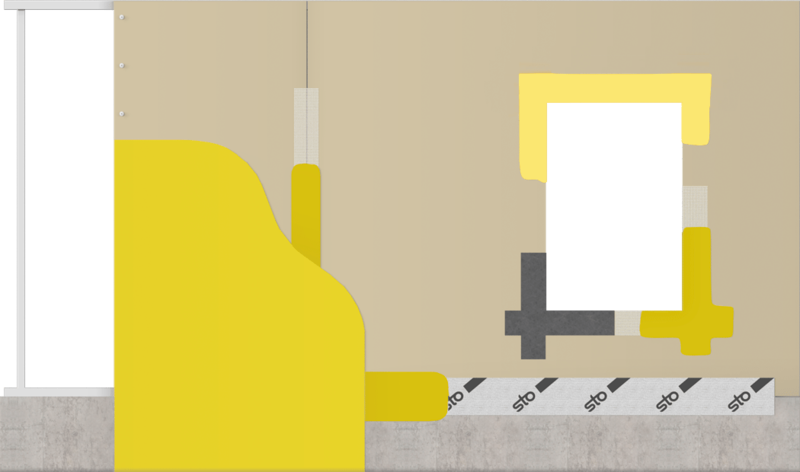 Sto Gold Coat® TA is a ready-mixed flexible, trowel applied waterproof air barrier membrane for use in StoTherm® ci Systems. It is applied directly to vertical above grade wall sheathing and concrete masonry, and functions as a waterproof air barrier when combined with StoGuard® joint and rough opening treatment. Sto EmeraldCoat® is a fluid-applied, vapor-permeable building membrane used under a variety of mechanically attached claddings, including cement board, wood, vinyl, brick, stone and metal panels. SUBSTRATE TYPE: Glass-Mat Gypsum Sheathing, Exterior Gypsum Sheathing, Exterior Plywood, OSB, Concrete Masonry Units. Sto ExtraSeal™ is a portland cement-based air and moisture barrier component for use beneath direct applied stucco brown coats. It is applied by trowel or pump to vertical above grade concrete and concrete masonry (CMU) wall surfaces. 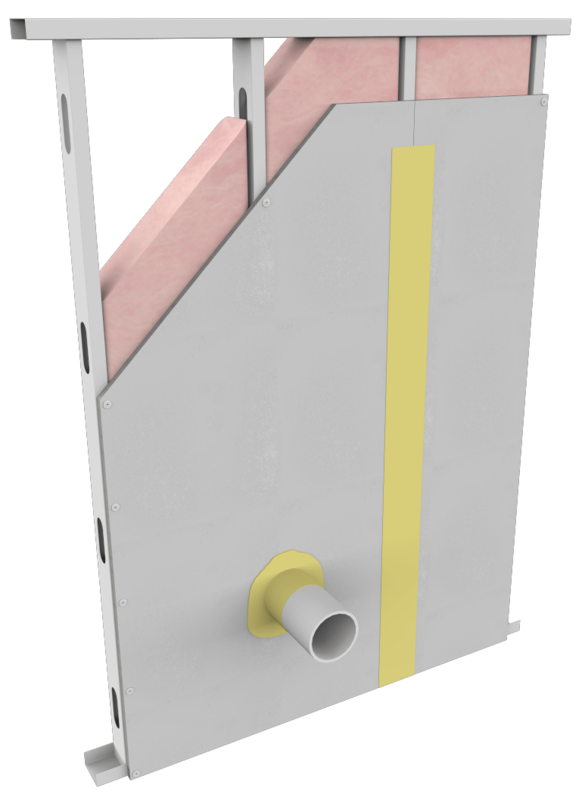 Sto AirSeal™ is a fluid-applied, vapor-permeable membrane designed for above grade walls behind various claddings including, stucco, brick, metal panels, cement board, others, and for use in StoTherm® ci Systems. SUBSTRATE TYPE: CMU, Concrete, Brick Masonry, Glass-Mat Gypsum Sheathing, Exterior Plywood, OSB..
Sto VaporSeal™ is a ready-mixed, flexible waterproof air and vapor barrier membrane. It is used on vertical above grade walls behind various claddings including, stucco, brick, metal panels, cement board, and others. 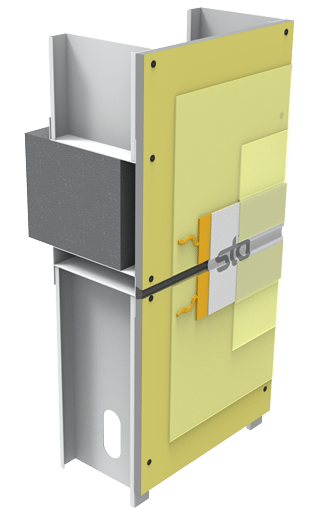 The StoGuard® System includes sheathing joint treatments optimized for a variety of conditions and trades. Proper protection of sheathing joints is critical for minimizing the risk of moisture intrusion and unwanted air movement. 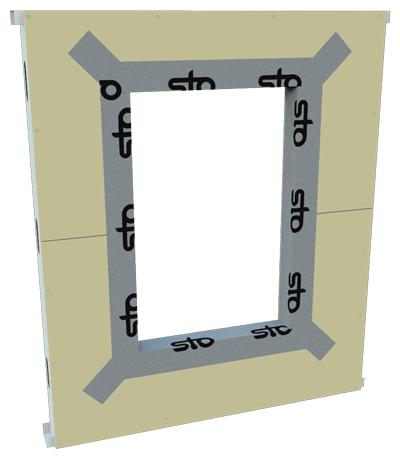 Sto RapidGuard ™ is a single-component, multi-use air barrier and waterproof material used to seal rough openings, sheathing joints, seams, cracks, and transitions in above grade wall construction. Its fast-drying, flexible coverage makes it easy to provide high-quality air and moisture protection across multiple applications. Sto Gold Fill® is a ready-mixed, flexible, joint treatment and air barrier material for vertical above grade walls. It is applied to rough openings, corners, and sheathing joints in walls with StoGuard® Mesh. SUBSTRATE TYPE: Glass-Mat Gypsum Sheathing, Exterior Plywood, OSB. StoGuard® Mesh is a glass fiber self-adhesive mesh for use with Sto Gold Fill®. Available in 4.25- and 9.5-inch widths. TYPE OF APPLICATION: 4.25” (108 mm) wide mesh at sheathing joints and 9” (241 mm) wide mesh at rough openings and inside and outside corners. StoGuard® Fabric is a non-woven cloth reinforcement. 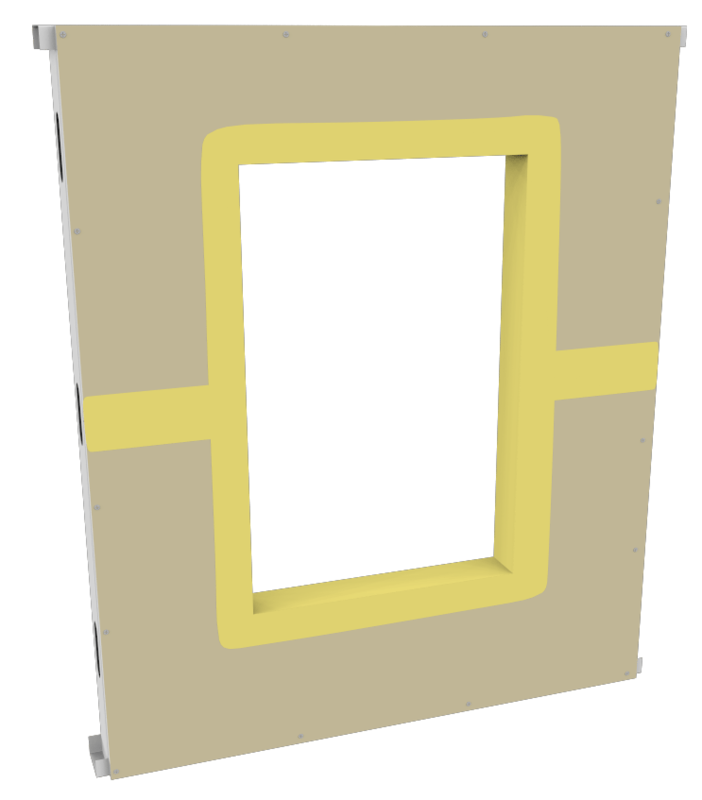 It is part of the StoGuard® assembly and is used with either Sto Gold Coat®, StoGuard® VaporSeal™ to treat sheathing joints, inside and outside corners and rough openings. Available in 4- and 6- inch widths. SUBSTRATE TYPE: Suitable for application of Sto Gold Coat® or StoGuard® VaporSeal™. TYPE OF APPLICATION: 4” (101 mm) wide fabric at sheathing joints and 6” (152 mm) wide fabric at rough openings and inside and outside corners. 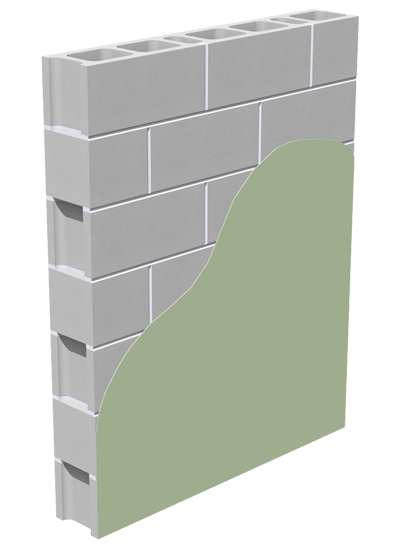 StoGuard® Transition Membrane is a flexible air barrier membrane for use on vertical above grade walls. It is used with StoGuard® air and moisture barrier membranes including Sto Gold Coat® and Sto VaporSeal™. 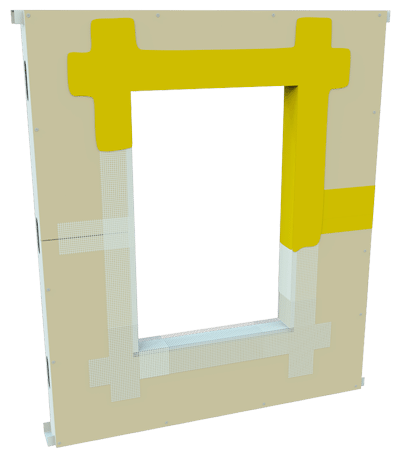 It is used at detail areas to provide flexible connections to achieve continuity of the air barrier assembly. It also functions as a secondary weather seal at joints in construction. SUBSTRATE TYPE: CMU, Concrete, Brick Masonry, Glass-Mat Gypsum Sheathing, Exterior Plywood, OSB. TYPE OF APPLICATION: For continuity at transitions, installed with any of the StoGuard® fluid-applied air barrier products. The StoGuard® System includes rough open protection optimized for a variety of conditions and trades. 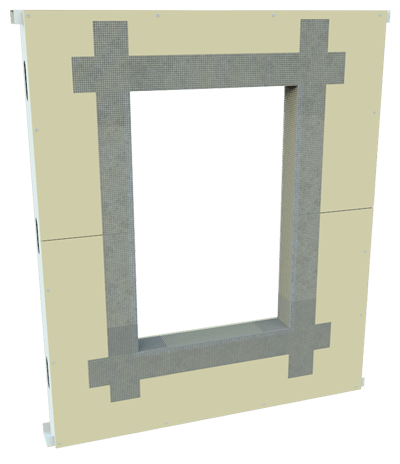 Proper protection of rough openings joints is critical for minimizing the risk of moisture intrusion and unwanted air movement. StoGuard® Tape is a self-adhering air and moisture barrier material composed of spun bond polyester fabric laminated to rubberized asphalt adhesive. The polyester fabric strengthens the material while providing a surface to which most coatings will bond. Available in 6- and 9- inch widths. SUBSTRATE TYPE: Smooth surfaces, including primed Concrete, CMU, Glass-Mat Gypsum Sheathing, Exterior Plywood, OSB, Cement Board, Asphalt saturated Felt and most House Wraps. TYPE OF APPLICATION: Apply on rough openings to provide protection. StoGuard® RediCorner™ is a preformed fabric piece used in the corners of the rough openings for quicker installation. Used with either Sto Gold Coat® or StoGuard® VaporSeal™. 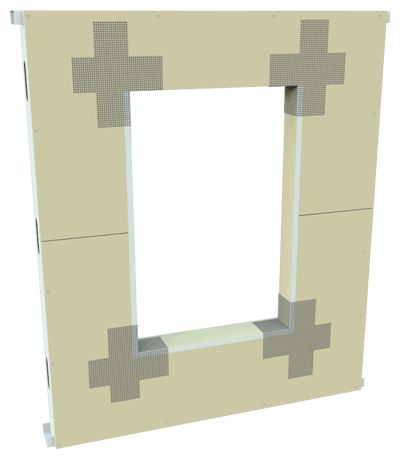 TYPE OF APPLICATION: Placed on the inside and outside corners of rough openings.